Well maintained newer home just 15 minutes from downtown Steamboat has room for everyone, and horses are welcome. Remodeled in 2008, this 5 bedrooms 3.5 bathroom home sits on 36 acres in the south valley. 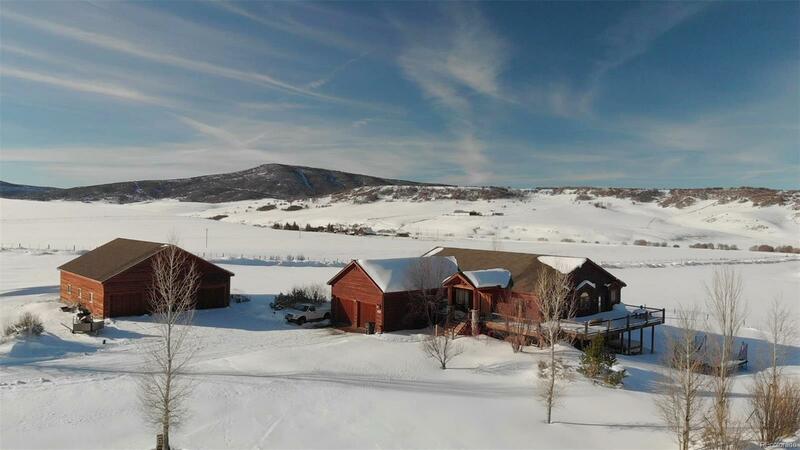 Enjoy 3 landscaped and sprinkled acres and massive wrap around deck looking at the Steamboat ski area. The home features custom finishes, large master suite with heated bathroom floors, hand-troweled walls, large gas fireplace and two large living areas. Park your large trucks in the oversized 2-car garage, and enjoy high ceilings throughout the home, Viking and GE Profile stainless steel appliances, double ovens, granite counters, and even a sound-proof home theater. An unfinished space on the lower level has walk-out access and would make a perfect apartment. A large 60x40 foot detached garage has enough room for cars, trucks, and toys. This rural oasis is even within the Steamboat school district. With only four other neighbors, this small community has no HOA.